Everything Jesus does is so fascinating and instructive. There's so much that could be said about each of these 'editions' that it's hard to really decide what to include. I've put this edition off for far too long for just that reason. For example, last time I was simply writing about how Jesus gathered his disciples but there are some really comical interchanges (I think) as Jesus first meets his future disciples through their friends. Take John 1:42. 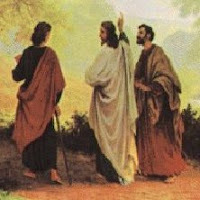 Andrew brings Peter to Jesus and the first thing Jesus says to Peter is 'hey buddy, I'm gonna call you 'The ROCK'! Or when Jesus meets Nathaniel (John 1:46) his first words are 'hey, here comes an honest man!'. You can almost see a smile on Jesus' face as he establishes himself as a guy with something about him that they would want to follow. > Jesus @ 31 years & 2 weeks old - So after gathering his first followers, Jesus hangs out with them in Capernaum for a while (John 2:12). Lots can be said here about discipleship. Spending time with people. Deepening relationships. Having no agenda. Too often I see Christians that hustle their contacts/disciples from this event to that event and rarely just hang out with them. Think about it. If you had someone that was interested in following Jesus what would you do with them? Bring them to a program/church/event? Jesus' strategy is totally different, he seems to me to be anti-programatic in his discipleship. He takes them home to meet his mom. Is that something you've ever done? Bring your friends to meet your family? Let them spend time in your home. Ask yourself, how often do the people in your church programs come to your home? Would people that are in your church programs be able to 'just drop in' and stay with you for a few days? It doesn't sound like something that could make the church bulletin but it's exactly what Jesus does. Then they go to a wedding in Cana of Gallillee (2:2) and He does a simple miracle there. I won't comment on this, other than to wonder what Jesus meant when he said 'woman, my time hasn't come (John 2:4)'. As you read through what Jesus did in the next few weeks, was he saying he didn't want to be revealed until the time was right in Jerusalem at the passover? I'd be interested to hear thoughts on that. What happens next is phenomenal. How did Jesus go from being a poor carpenters son from Nazareth to national phenomenon in such a short time? Was it simply his magic Jesus skills that helped him, or was he more strategic? John 2:13 mentions Jesus taking his disciples down to Jerusalem for the passover. It's what every good Jew would do. Take a pilgrimage. Sacrifice. Once again everyone would be there. Jesus once again decides to crash the biggest party in the country. This time though there's nobody to introduce him so he makes his own introduction. Cue Super Bowl Sunday part 2. Jesus has already developed grass-roots word-of-mouth interest throughout the country, reminiscent of William Wallace lore in Braveheart ("William Wallace killed 50 men"), about who he was. So what is Jesus' next move? He takes it to the next level by going to Jerusalem with his new disciples and making a massive spectacle! There are so many applications here I don't know where to start. Think about this, there is already a buzz in the country about who this guy is that John baptized, but now he goes to the capital city Jerusalem right at Passover time and intentionally picks a fight with the religious leaders!! If being baptised by John the Baptist was Superbowl Sunday then this stunt is the World Cup of Soccer in comparison. Everyone that was there to see John the Baptist would be there in Jerusalem. Also, all those people who weren't there, but heard reports about 'this one' would also be there. All the whispers are now escalated. He did what? In the temple? Did you see him? Who is this guy? This is what would be heard at supper tables across the land. The strategy Jesus uses is amazing to watch. Literally everyone in the entire country is talking about him, as well as other pilgrims who had come from other places just for the passover. I liken it to the scene when V takes over Jordan tower in the movie V for Vendetta and gets his message to the entire country. With these 2 huge publicity stunts Jesus ensures that he is the talk of the town and all eyes are on him. He sets the stage for eveyone to be interested in everything he's doing. Every move will create more whispers. Every sentence will be analyzed. The stage is set. While I can barely contain the excitement of this, next time I will look at the content of what Jesus does in the temple and what statement he's making with all this publicity.